By John M. Feierabend, © 2014 GIA Publications, Inc. Dances accompanied by singing have been enjoyed by people of all ages for hundreds of years. These dances have served an important social function as people share the joy of synchronizing with others through their body, spirit, and voice. John M. Feierabend collects into one place an addictive collection of Song Dances that have their roots in our American heritage, as well as a few from other countries. Each dance is organized by type (single circle, double circle, square dances, etc.) and includes complete dancing directions. 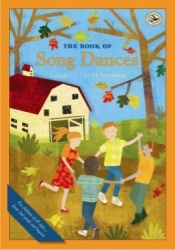 This beautifully illustrated collection is for anyone looking to reclaim this great folk dance tradition, use great songs to teach musical concepts - or simply have a great time. Enjoy! John M. Feierabend is one of the leading authorities on music and movement development in early childhood. Dr. Feierabend is committed to collecting, preserving and teaching the diverse folk music of our country and using that folk music as a bridge to help children understand and enjoy classical music. He is a Professor of Music at The Hartt School of the University of Hartford.